If you’ve ever designed or remodeled a kitchen, you know there are an overwhelming number of decisions to make with regard to cabinets. Keep the old, or buy new? Reface or repaint? Adjustable or fixed shelves? Even once you’ve made what may have seemed like a million decisions, there’s still one more consideration: the hardware. 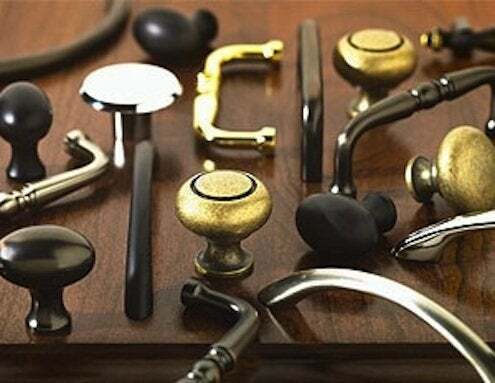 Cabinet hardware is the ultimate accessory that can impact your room style. It’s the hat, shoes, and handbag of the kitchen (or any other room for that matter). The knobs and pulls you choose can send the design of your space in one direction or another, or they can bring styles together to make them work. For instance, the simplicity of Shaker cabinets allows them to work well within many different design styles. Oversized, tubular hardware in a brushed nickel finish makes a white Shaker-style cabinet feel distinctively modern, while glass knobs would give very similar cabinets a vintage flair. 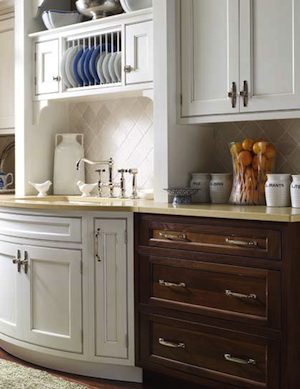 Pair white Shaker cabinet doors with oiled bronze pull cups and knobs, and you might as well be in a Tuscan villa. Your hardware selection or selections can help bring mixed styles together, a very popular move in contemporary kitchen design. In fact, it’s not uncommon to see different hardware types and finishes side by side. Brushed nickel bin pulls complement gold-patterned and mercury glass knobs for a fantastic modern-vintage mix in a painted gray-and-white kitchen makeover. Modern farmhouse chic comes alive with a combination of nickel-finished straight pulls and black iron barn door hardware. While you’re making your decision, make sure to attend to practical matters as well as aesthetics. Traditionally, knobs are used for doors, pulls for drawers. But a beautiful knob is useless if it doesn’t fit in your hand so that the door opens easily. Make sure the hardware feels good. And if knobs just won’t work for you, don’t be afraid to use pulls on everything. Also, keep in mind the type of maintenance your hardware will require. Textured pieces are more difficult to clean, and some finishes (e.g., brass) require more upkeep. So pull out the catalogs and start surfing the internet; choices abound, and there’s nothing to hold you back. Whether you’re buying new cabinets or sprucing up old ones, your hardware can do a lot of design work for a considerably small amount of your project budget. If in two years your tastes change, you can always switch your hardware out for something that gives you a different look—a new hat and handbag for your kitchen!